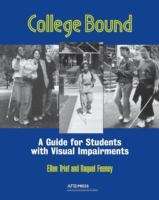 This book provides an essential reference source, serving as both a step-by-step guide for students to use independently and a much-needed text for educators to use to prepare students with visual impairments and blindness for success in college. It is organized into sections that can be read and worked on independently in whatever sequence best meets the student's needs. Appendixes contain charts that can be reproduced, resources for further information, and sources of products and materials.